This page can only but deal with the past! Nevertheless the CN pictorials should grow&blossom! 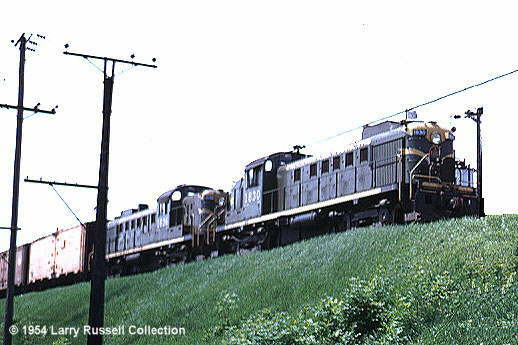 Gary Zuters tells (March 8th, 98): Unfortunately the news on the CN side is not good, they retired 23 M420/HR412Ws this month, and all but three of the HR616s. I havent seen an MLW leading for over a month. Good news is most of the M420Ws are going to shortlines, and not scrap.The count of active MLWs is down to the single digits, 3 HR616s, and 5 M420Ws. These are to disappear by mid-April!!! By April 6th, no MLW or BBD was in regular service with CN. Some are still leased to the Hudson Bay Railway and the New Brunswick East Railway. This was the end of an era - nearly coinciding with the CP! CN 9400 is part of an order of 8 ALCO FA-1 locomotives (CN 9400-9407) manufactured in 1950 by MLW. They were all retired by 1968. 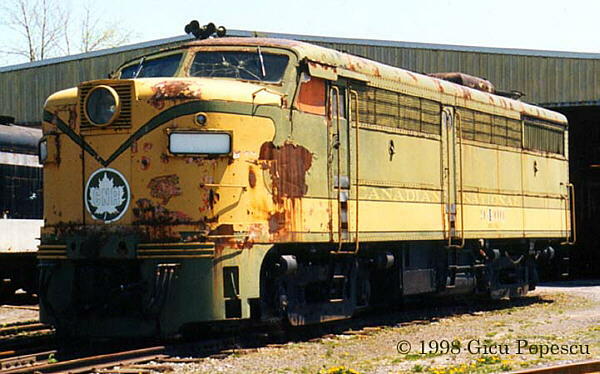 However, in 1969 CN 9400 was donated to the National Museum of Science and Technology, Ottawa, Ontario, where it stayed until 1986, when was moved to CN in Montreal. In 1989 it was moved again to the Canadian Railway Museum, St. Constant, Quebec, where this picture was taken in the summer of 1995. Although marked by time and weather, we can still admire the 1950 original paint scheme used for repainting after retirement. RS3 1830 leads a class mate with a freight at Montreal, 1954. MLW RS-18 Nothing inside yet!